It’s been a long time since I ticked one of my ‘book calendar books’ off of my TBR. I had a page-a-day book calendar in 2013 and it made my TBR swell for the first time. This book made the list, others were not as successful. I was looking for something to keep me occupied while I wait for GoT to come back and this was an option so I snatched it up. With the opening line of Silver Sparrow, “My father, James Witherspoon, is a bigamist,” author Tayari Jones unveils a breathtaking story about a man’s deception, a family’s complicity, and the two teenage girls caught in the middle. Set in a middle-class neighborhood in Atlanta in the 1980s, the novel revolves around James Witherspoon’s two families—the public one and the secret one. When the daughters from each family meet and form a friendship, only one of them knows they are sisters. It is a relationship destined to explode. This is the third stunning novel from an author deemed “one of the most important writers of her generation” (the Atlanta Journal Constitution). I wasn’t really sure what to expect from this book. To be honest, I’d forgotten the premise of it when I started listening but as the summary says, the opening line is gripping. Dana, the ‘illegitimate’ daughter, narrates the first half of the book. Through her eyes, we see Chaurisse and Laverne as ‘the other women’ and we develop a dislike for these two women who are taking everything away from Dana and Gwen. Then it’s flipped. Chaurisse gets to finish the story and we see how much love there is in the Witherspoon family and I started to feel bad for Chaurisse. At the same time, we see Dana through Chaurisse’s eyes and feel bad for her and Gwen. It was expertly done, in my opinion. Jones is a great story-teller. Dana and Chaurisse were both products of their environment and it showed well in their personalities. Dana is taught to believe she’s better than others because her mother thinks her daughter is better than Chaurisse. Chaurisse is taught that she’s a blessing and acts like everyone’s guardian angel. I could see these people growing up on different sides of the city, both girls having the same father and being so different from each other. The parallelism was really great. It’s hard to say who my favorite character was. At first, I liked Dana while she told the story. Then I liked Chaurisse. The one person I liked consistently was Raleigh. I felt bad for him after we learned how much he loved Gwen but I loved that he was always there for all of the characters, even James, when they really needed him. I felt the most for Laverne. I’m not sure I share much of a history with her, but she was a good woman. She worked hard and was very loving, something I see in my mother and hope to be myself one day. It was hard to see James hurt her like he did, especially the way Gwen broke the news. I wasn’t surprised Laverne took James back, though I don’t know if I could have. I wasn’t surprised he wanted to be back with her. She was a comfort to him while Gwen was an escape. If you can only have bread or chocolate for the rest of your life, you’re better off picking bread. I liked Dana’s narration best. It was more exciting, to say the least. And it had a lot more emotion. There was a lot more to be had, really. She had perpetual anger and judgment where Chaurisse had no reason to have those feelings every day. It was more charged. I’m still trying to figure out who I feel bad for. I hated how we saw Gwen after the big reveal. I liked Gwen. She was rough and angry, but she was likable. The way Chaurisse saw her made her really hard to like. She wasn’t a loving mother; she was a home wrecker. That was hard to rationalize in my mind. The audiobook was really well done. There were two narrators, Rosalyn Coleman-Williams and Heather Alicia Simms. I’m not sure which is which, honestly, but both were wonderful. I wasn’t expecting the second narrator but I liked that the producer used two voice actresses. James challenged what Chaurisse and Dana defined as family. To Dana, it was her and her mother; that was it. James wasn’t a permanent part of her family. Arguably, Raleigh was more a part of her family than her father was. For Chaurisse, her mother and father were constants and Raleigh was a bit more fringe because she had a solid male figure in her life. When James was found out, both girls questioned everything. Did they really have a sister? I don’t think either felt like they did. Writer’s Takeaway: The duly narrated storyline was great. I loved that tool to set up the story through Dana’s eyes and finish it with Chaurisse. I liked how Jones kept perspectives and ideas of how things worked for Dana out of Chaurisse’s eyes and vice verse. Each felt like a separate story but the connections made them a novel. It was a great tool to use in the story. I loved this book and couldn’t find a fault in it. A full 5 out of 5 stars. 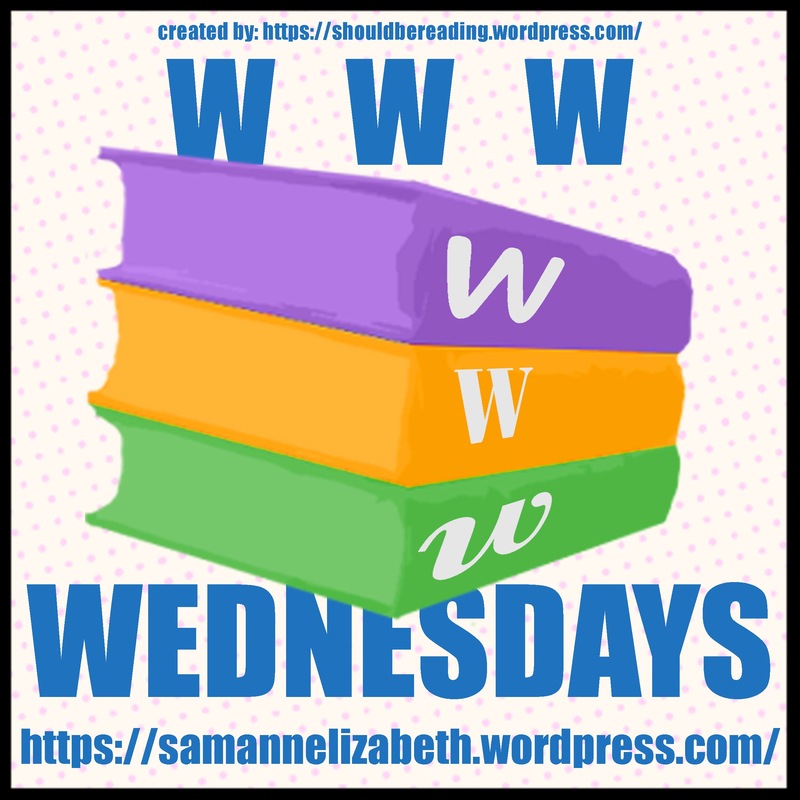 Welcome to WWW Wednesday! This meme was formerly hosted by MizB at Should be Reading and revived here on Taking on a World of Words. Just answer the three questions below and leave a link to your post in the comments for others to look at. No blog? No problem! Just leave a comment with your responses. Please, take some time to visit the other participants and see what others are reading. So, let’s get to it! Currently reading: I’ve just put aside Harry Potter y el misterio del príncipe (Half-Blood Prince) by J.K. Rowling so I can start a new book. I hope to get back to it soon, I was getting to the meat of it! I’m really hoping to start back with A Clash of Kings by George R.R. Martin very soon! Maybe on disk, but it will take me a while to find where I am. We’ll see. I was so embarrassed about my minimal progress with In the Garden of Beasts by Erik Larson that I made a point of reading it this week. I’m at 13% now, so much better but still behind. I wasn’t able to finish Child 44 by Tom Rob Smith before my book club met. I was close, one disk left, but I watched the movie in order to see how it ended. I’ll still finish it, though. I’m looking forward to comparing the book and movie. It’s not the ideal running book, but I’ve made good progress with Silver Sparrow by Tayari Jones while running this past week. I’m getting toward the end so I hope to finish it soon. I started The Virgin Blue by Tracey Chevalier on Monday night. Not too far into it yet so no comment but I do love this author! Yes, I realize I have WAY too many books going at once. I hope to clear this list up really soon. Recently finished: Just one. I finished the quick read of The Tales of Beedle the Bard by J.K. Rowling and wrote a review which I posted Monday. It’s not much, but it’s something! Reading Next: No plans again. I’m going to try to get through my massive list before I take on anything new! After what seems like a long wait, my book club finally met last week to discuss Norwegian by Night by Derek B. Miller. I absolutely loved this book and had been really anxious about this meeting. I’m thrilled to say a lot of others were as anxious as I was. We talked first about the author who is not a writer by trade. He works in security affairs, specifically with the UN for disarmament research and to reintegrate former soldiers and noncombatants back into non-military life. We saw this come through in Enver’s character and it helped us understand how he could write that subculture so well. This book won The Crime Writers’ Association New Blood Dagger Award, an award that has been won by some big name authors including Janet Evanovich and Gillian Flynn. Miller’s next book is due out in January 2017 and many in our group are excited to read it. Most of our conversation was about the amazing Sheldon. His dementia was a key point in the story. We didn’t think he was properly diagnosed with dementia. One of our members works with those in early stages of dementia and she didn’t see similarities with her patients. He was aware that Bill wasn’t really with him when they spoke and he was able to formulate a plan. We think it was more likely PTSD. He had kept his life hidden from those around him but after his wife died, finally felt he could open up to the truth. When he started to talk about things no one had heard of before, they assumed he was demented. We thought it was likely that after his wife’s death, he felt stagnant, like he couldn’t move on in his life and drifted through as best he could. This might have been perceived as dementia. It was obvious to us that the adventure he found himself in kicked his brain into gear and had him thinking like a marine again. The stress and situations brought back all his memories and training and even at 82, he knew what to do. The only thing that made us doubt he was able minded was when he mentioned that he couldn’t remember filing anything and that was why he thought he was a sniper. If it was a joke, we missed it. Maybe he was losing it, but everything else in the book pointed to him knowing exactly what was going on. The death of Saul haunted Sheldon for his whole life. We felt the interactions between Sheldon and his son when he returned from his tour of Vietnam was very real. There was an implied understanding between the men but it was a gap between them they were unable to fill. Sheldon felt Saul’s death was his fault and wanted to make amends for it his whole life. Saving Paul at the end of the book was Sheldon’s way of coming to peace with what he had carried around his whole life. Personally, I thought it was a beautiful ending. Why didn’t Paul talk? No one else agreed with my theory that he was deaf. Oh well. They all thought he was traumatized, which had pushed him into silence. Even a few days out from the event, he was still too stunned to speak. We all hoped that Rhea and Lars would adopt Paul at the end instead of finding some distant relatives to take care of the boy. He would be a good son for them if they could find a common language. Miller writes about Norway like it’s a character in his book. He’s lived in Norway a long time and his wife is Norwegian. He says he was poking fun at his wife’s family and the culture of Norway. We have two members of our group who had lived in Europe for a while and thought the portrayal of Norwegians was spot on. They are polite to a fault, waiting until the early 2000s to apologize for their actions in World War II. One of the ways Miller criticized Norway was in their openness to Kosovars and Serbs after the Yugoslavian conflict. Enver was welcomed into the country without question. Whether he was seen as a freedom fighter or a war criminal was no matter. What he’d done to Paul’s mother was no issue. We saw a strong contrast between Sheldon and Enver. When Sheldon came back from war, he was quiet and clammed up. Enver was still angry and lashed out at everyone. Guilt was a strong theme in this book. Sheldon’s guilt over Mario’s death haunted him especially. It was such a simple thing, to take a step to improve a picture. Why did Mario movie and not Sheldon? This little thing must have haunted him he whole life. We all liked the book. We loved the layers of the plot and how we got deeper into the characters with every page. The multiple points of view all worked. Many books with multiple POVs slow down, but we liked all of the voices in this novel. It was so well crafted. Our next book will be The Glass Castle by Jeanette Walls which I read a few months ago. I’m looking forward to the discussion! Yes, this is another short little book that I read. It’s all I’ve had time for while I’m making my way through so many long books lately. My husband took me on a book spree during teacher appreciation week at Barnes and Noble and I’ve been wanting a copy of this forever. It was a good time to buy and I devoured it immediately, starting on the car ride home. The Tales of Beedle the Bard, a Wizarding classic, first came to Muggle readers’ attention in the book known as Harry Potter and the Deathly Hallows. Now, thanks to Hermione Granger’s new translation from the ancient runes, we present this stunning edition with an introduction, notes, and illustrations by J. K. Rowling, and extensive commentary by Albus Dumbledore. Never before have Muggles been privy to these richly imaginative tales: “The Wizard and the Hopping Pot,” “The Fountain of Fair Fortune,” “The Warlock’s Hairy Heart,” “Babbitty Rabbitty and Her Cackling Stump,” and of course, “The Tale of the Three Brothers.” But not only are they the equal of fairy tales we now know and love, reading them gives new insight into the world of Harry Potter. This was exactly what I expected it to be. I loved the short fairy tale stories. I loved Dumbledore’s commentary even more. Rowling is so great at adding detail and background to everything without it being overwhelming. I thought the commentary she added was very thought out. It was nice to see how the stories reflected the wizarding culture and I liked knowing what was considered outlandish and what was considered out of line. It was a lot like real fairy tales from the way they were described. Some changed and others didn’t. I can’t say how much I enjoyed this! My favorite of the stories was The Fountain of Faire Fortune. I liked how the women realized they didn’t need luck to solve their problems and were able to find the strength within themselves. It was great that they had to use wit to get to the fountain. I loved the muggle knight who came with them. He was so hapless and wonderful, I totally would have fallen for him! I think The Tale of the Three Brothers is the most relatable. It’s easy to see why the first brother wished for power, something men desire. We all want to vanquish our enemies and be powerful. It’s easy to see why the second brother wished for something he’d lost as many pines for something they no longer have. The story teaches us to be smart and to be moderate in our desires so that we can persevere. I was so glad to finally read Babbitty Rabbitty and her Cackling Stump. I love quoting Ron from the DH2 movie when he talks about Babbitty. It was a really cute story and I loved Dumbledore’s commentary about how Beedle must have never met an animagius. It had me smiling. If forced to pick a least favorite story, I’d have to say The Wizard and the Hopping Pot. That’s not to say I disliked it, only that it didn’t make me smile as much as the others and I felt the story was more predictable than the others. It seemed obvious that the young wizard would have to help the people to get the pot to leave him alone so it wasn’t a surprise of an ending. As the commentary says, there are problems that magic cannot solve. Witches and wizards have to think of other ways to solve their problems. Sometimes, magic creates the problems and magic cannot end them. It was fun to see fair tales, which we think of as magic, turned on their heads and made more magical and more fun. Writer’s Takeaway: This book was fun. It’s been a while since I read a fun book and I loved it. Rowling is donating all the proceeds to Lumos, her charity and I think it’s great that she choose something so fun and lighthearted to generate revenue from. Plus, it was well priced! Charity and fundraising aren’t always associated with book sales but I really like what Rowling did with this title. A really fun quick read. A full 5 out of 5 Stars. After a book review and two book club reflections, I’m finally able to post about meeting author Lisa See. She flew in from California to speak to us on April 11th and I went with my mom to hear what she had to say. See was able to speak really well to her family’s history in California. Her great-great-grandfather was the first to come over from China though he went back and it was her great-grandfather who first stayed. She used him as the inspiration for Old Man Louie. See said there were eight things she wanted to talk about when she wrote Shanghai Girls. Unfortunately, I only got down seven of them. I don’t know what I missed, but here they are. Shanghai. It was at the peak of its splendor right before the Japanese invasion and she wanted to talk about how it changed. Beautiful Girls. She loves the posters and collects the memorabilia. Arranged Marriages. In her family, one great-uncle took his nine sons back to China and all returned home with wives as part of an arranged marriage. She wanted to talk about how these marriages can end up. Angle Island. Immigrants were held there from anywhere between two weeks to two years. Most of the stories written about the island tell the story of men. See was able to find documentation of a female relative of hers that came through the island and took many of the questions from Pearl’s interrogation right from her relative’s interrogation transcript. When touring the island once, See was told there were no records of babies being born on the Island though many have personal stories. These babies, officially, did not exist. China City. See’s great-grandpa owned a shop at the beginning of China City, much like Old Man Louie. Growing up, See’s family still owned it but she was afraid China City would soon fade into history. The Confession Program. It wasn’t an amnesty program, but a confession program and See wanted to show why. Sisters. See has two half sisters and a former step-sister herself and wanted to talk about the relationship. One of her sisters reads her manuscripts and wants to be very clear that they are not Pearl and May from the book. Continuing with lists, See told us about her three biggest inspirations to write. She said overall, she was encouraged by the 1,000s of female writers Yangzi Delta which showed her women could be successful writers. These three quotes and sayings inspired her as well. Art is the heartbeat of the artist. You have to cut to the bone to write. I love Stegner so I was really excited that one of his quotes inspired her. See was able to answer a few questions during a Q&A after she was done talking. It was mentioned that her new book will be called ‘The Tea Girl of Hummingbird Lane.’ It’s ready to publish, but with the election year going on, they wanted to wait until next June to put it out so there would be time for her on radio and TV to publicize it. She’s about to start research on the next book and will be traveling to Korea to start researching it. She said it takes her 2-3 years to write a book because of the research involved in the process. When she first wrote Shanghai Girls, she did not intend to write a sequel. She felt the end was a new beginning and it was a good way to leave our main characters. If you’ve read my review, you’d know how much I’m not OK with this. See’s editor pushed her to write the sequel and I’m told it ends on a bit of a cliffhanger as well. She has no intention of writing a third. See’s book Snow Flower and the Secret Fan was made into a movie. Asking her how she felt about the movie was great. See said they asked for her opinion on the changes they were making and she told them what she thought and they made the changes anyway. She looks at it in a great light, though. She said her story is filtered through her, but when it becomes a movie, the story is filtered through the director as well and his artistic ideas change what she’s already seen. I thought that was really positive. I was able to meet See and have my three books signed. I asked her the question I ask every author when I meet them. What advice would you give me to be as successful as you? She said to get into the habit of writing 1,000 words a day. Also to be passionate about what you’re writing. It doesn’t matter if only 5,000 people read what you wrote as long as it’s the right 5,000 people. Don’t worry about writing a best seller. I’m really glad the libraries worked to bring See in to speak to us. I’m looking forward to my next author appearance, Emily St. John Mandel in May. Currently reading: I’ still making my way through Harry Potter y el misterio del príncipe (Half-Blood Prince) by J.K. Rowling and thoroughly enjoying it. There’s so much I’d forgotten about and I’m having a great time reading it all again. Unfortunately, still on hold with A Clash of Kings by George R.R. Martin. I’m not happy about it. Urg. I think I read three pages of In the Garden of Beasts by Erik Larson. This is just the nature of me and ebooks, we’ll see how it goes. I’m getting worried about finishing Child 44 by Tom Rob Smith before my book club meets. It’s really not a book for me, I’m not a fan of the thriller genre and this narrator is still grating on me with terrible Russian accents. Blah. I’m enjoying Silver Sparrow by Tayari Jones while I wait to get Martin back. I was hoping to put this one aside and finish Martin if I got the hold back quickly, but it doesn’t look like that is going to happen. Sigh. Recently finished: I’m sad to say I haven’t finished anything! I need to buckle down and focus on some of these books but my semester will be over in another two weeks and I’ll be a lot more available then… until the next semester starts. Ugh. I posted my review of Texts from Jane Eyre by Mallory Ortberg. A lot of you were asking about that so go check it out! Reading Next: I’m still planning on The Virgin Blue by Tracey Chevalier. I’ll put Potter aside for this one so my ‘currently reading’ list is only going to grow, much to my chagrin. I put too many things on hold. Ugh. Here’s a short but fun post for y’all. My birthday was at the end of March and my very thoughtful husband tried to get me something invaluable and it worked about 70%. He wrote a letter to J.K. Rowling for me. He explained that she is one of my role models and how I want to enjoy even 1% of her success in my lifetime. He begged her to write me back, but, alas, Ms. Rowling receives too many letters to write back to everyone . I did, however, get this. I hear you are a great fan of “Harry’s!” [Husband’s name] has told me all about you and you sound like an amazing person. I’m sorry to say that I now receive so much mail that I cannot write to everyone individually, much as would like to. Yeah, it’s pretty rocking and very thoughtful of the hubbs to think of this for me. Anyone else have a Rowling letter? Anyone lucky enough to get an individualized response? My jealousy will be astronomical. My friend Katherine is a big fan of Jane Eyre. Getting her a book called Texts from Jane Eyre was an obvious Christmas present in my mind. Katherine told me how much she enjoyed the book and recently told me she reread it and still found it funny. When I had no audiobook and a lot of driving ahead of me, this seemed like a good choice to fill the silence. Everyone knows that if Scarlett O’Hara had an unlimited text-and-data plan, she’d constantly try to tempt Ashley away from Melanie with suggestive messages. If Mr. Rochester could text Jane Eyre, his ardent missives would obviously be in all-caps. And Daisy Buchanan would not only text while driving, she’d text you to pick her up after she totaled her car. Based on the popular web-feature, Texts from Jane Eyre is a witty, irreverent mashup that brings the characters from your favorite books into the twenty-first century. I loved parts of this and other parts went completely over my head. Even in books I’d read and liked, there were references I didn’t get. In The Outsiders, my favorite book, I was laughing so hard I almost pulled over at jokes about how all gangs watch sunsets and read poetry and how Soc is pronounced, but I didn’t think the bit about how blue Darry’s eyes are was funny at all. I don’t remember that being a big part of the story. The stories I wasn’t familiar didn’t do much for me (Sweet Vally High or Rebecca for example) but there were some really good jokes about those I did know, like Edgar Allen Poe and Ode to a Grecian Urn. So I would say this was very hit-or-miss with me. Being a comedy, all of the characters were way over the top. The ‘straight man’ in every conversation, normally an unidentified ‘friend’ not in the work, is the voice of reason and the literary figure, be it Emily Dickenson or Daisy Buchanan, is there to make you laugh. I wish the straight man had more often been a character from the book. There are great examples of when this happened (Babysitters Club, Jane Eyre, Harry Potter), but most of them did not. I thought my favorite bits would be from Harry Potter or The Outsiders, but I honestly think Hamlet was one of my favorites. He was the perfectly sullen boy who hated everything and his mother doted on him, hoping to make him happy. It was really funny and he was revisited a few times in the first part of the book so the joke was continued for a while and wasn’t a quick passing bit like so many others. I did, however, really enjoy the short Harry Potter bit. I appreciate all references to wizards having no common sense about money or numbers because I honestly can see how that would happen. I was really disappointed in the Great Gatsby bit. I think Ortberg could have done so much more with Daisy and I thought the two short bits about picking her up after a car crash were a bit repetitive. Oh well. Only so much I can expect someone else to do with one of my favorite books. The audiobook I listened to was narrated by Amy Landon and Zach Villa. It was nice to have two genders do the narration for this because it was easy to tell between the speakers in the text conversations. There were some conversations where the conversation needed to be two men or two women. I thought Villa did a better job at handling this. Landon’s two voices were too similar in my opinion and I had time distinguishing who was speaking in a two person conversation. I didn’t have that problem with Villa. Writer’s Takeaway: The comedy in here was really smart, though not always up my alley. I think it’s good that Ortberg did bits from so many works and writers. It almost assured that there was something in there for every reader. There were some more I wish she’d done, including Frankenstein and Steig Larson’s Millenium series but I’m not complaining too much. It was funny and I laughed, some more than others. I think she should have picked bigger themes in some of the works because, as in the case of The Outsiders, even for a fan, it seemed obscure. I liked some of it and didn’t get other parts of it. So that’s hit-or-miss to me. Three out of Five stars. I’ve decided to use my travels to explore as many indy and used bookstores as I can. Two weeks ago, my husband and I took a long weekend vacation over to Grand Rapids, MI to explore the local breweries. Of course, I squeezed in a bookstore visit. This time around, I chose Argo Books for my exploration. Yes, it was snowing in April. This is one of several bookstores in Grand Rapids, but the only one open while my husband was OK with me striking out alone. It’s situated a bit off Wealthy Street west of the city in a very cool ‘hipster’ area. Needless to say, there are a few breweries within walking distance (one with excellent Vegan pizza, I can report). Walking in, the store had a limited general fiction and a large assortment of comic books. Many of them were collectors pieces stored in plastic bags. I’ve never seen such a large collection in a large bookstore, it’s something I’m more used to when I go to comic book stores or hobby shops with my husband. There was a second room separate from the fiction/comic room that held primarily sci-fi books but other odds and ends. I looked through biographies (separated by general, political, sports, and pop culture) and a small foreign language section (mostly French and German, unfortunately for me). Another section that I was really surprised about was a large collection of LIFE magazines dating back to the 50s. My quick inspection left me impressed. It looked like they had most issues sequentially. It was a fun place to look through. There were a few other people in the shop, two looking at fashion books for a friend and another couple looking for vampire literature. I went back to the front before I left and overheard the employees talking about a kazoo symphony while I looked through children’s and YA. I did find one book I wanted to purchase, The Man Who Loved Cat Dancing by Marilyn Durham. Durham is the only listed ‘novelist’ on my university’s notable alumni page. I hope to be the second. I felt I should read her book and see what company I might be among. I’m likely heading about a few times this summer. I’ll be sure to report back with some great bookstore findings! Currently reading: It’s been great to work on Harry Potter y el misterio del príncipe (Half-Blood Prince) by J.K. Rowling lately. I love this story and there’s so much I’ve forgotten since I last read it. I’m half way through now! I wasn’t doing too well with A Clash of Kings by George R.R. Martin and then I lost the hold! I still have the physical audiobook but I have to finish Child 44 first so as of now, this one is unfortunately on hold. I don’t think I’ve read any of In the Garden of Beasts by Erik Larson since last week. Being on vacation slowed that down a lot. If you’ve been here a while, you know I’m slow on ebooks anyway. This one will take a while. Slow progress still on Child 44 by Tom Rob Smith. I’m still not enjoying it much at all. The narrator does a terrible Russian accent for each character and I can’t see any semblance of a plot yet. It’s very meandering and there were two prologues which turned me off right away. While I’m waiting to get A Clash of Kings back (again), I started listening to Silver Sparrow by Tayari Jones. This is a book that appeared on the book calendar I had in 2013 that grew my list exponentially. I’m glad I found it on eaudio. Recently finished: Hoping my loss of Martin would only be 24 hours while the system reset, I took Mallory Ortberg’s Texts from Jane Eyre with me on a business trip. It was really fun and passed the hour drive quickly. Review to come next week. Two reviews to share! I posted my thoughts on Slaughterhouse-Five by Kurt Vonnegut on Friday. I liked it enough though I probably would have liked it more had I read it in a shorter time-span. Three out of Five stars. I also reviewed Norwegian by Night by Derek B. Miller while I loved. I’m excited to talk to my book club about this one in a few weeks and see if anyone else felt the same. Reading Next: Next will likely be The Virgin Blue by Tracey Chevalier for my book club. This is one I’ve had on my shelf for a while because I’m a fan of Chevalier’s books. I suggested it for the book club and they said yes! Hahaha! I’m hoping to finish Potter before I start this, but no promises with how long it takes me to get through one of those in Spanish.